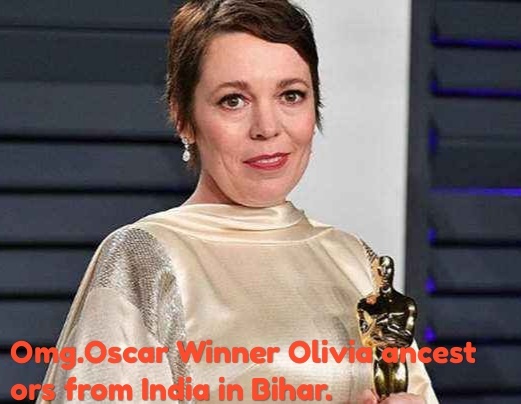 Omg.Oscar Winner Olivia ancestors from India in Bihar. Oscar Winner Olivia came to India, discovered that his ancestors are from Bihar. Olivia Coleman, who won the best actress award for the film 'The Favorit' in Oscars in 2019, is from Kishanganj in Bihar. This search of Olivia has also been shown in a British documentary. In addition to winning the Oscars of the documentary on the girls of a village in Hapur, besides those who won Academy Award in the second category, there is also a connection with India. This connection is from Olivia Coleman, who won the Best Actress Award for 'The Favorite'. A few months ago Olivia had come to know that his ancestors lived in India. They came to India to find it and they got many important information. They came here to know two things. His mother's ancestor Richard Campbell Bazzet, who came to India as an employee of the East India Company during British rule. Olivia knew that her mother's name was Charles's wife Harriet and she was related to Kishanganj in Bihar. In fact, Olivia found out that Harriet's father was probably living in Kishanganj with an Indian woman and Harriet was her child. This discovery of Olivia has also been shown in a British documentary. Olivia's grandmother gave her mother money to the UK. After getting this information, Olivia had said, "I thought there would be no foreigner in our family, but I was wrong."